As was to be expected, on the first day after Mr. Francois Legault’s populist CAQ won a majority in Quebec and ousted Liberal Mr. Philippe Couillard, the clashes with the Liberal Canadian Prime Minister Mr. Justin Trudeau started. The Canadian PM stated that he had called to congratulate Mr. Legault and hoped the two could cooperate for the sake of Quebec. Related coverage: <a href="http://thegoldwater.com/news/38460-Canada-Populists-Trounce-Trudeau-s-Liberals-In-Stunning-Quebec-Election-Victory-Video"> Canada – Populists Trounce Trudeau’s Liberals In Stunning Quebec Election Victory (Video)</a>. 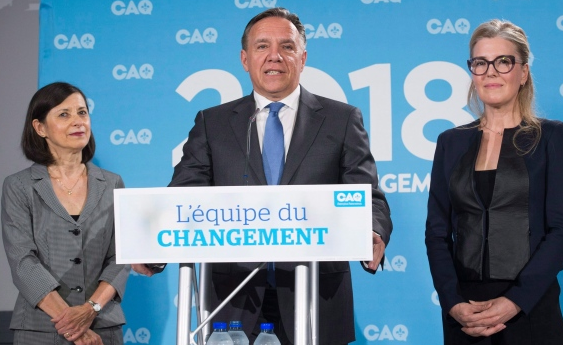 During his own victory speech, CAQ leader and new Quebec PM Mr. Francois Legault said he was dissatisfied with the concessions that Canada made in their new NAFTA deal (now called the United States-Mexico-Canada Agreement) and was adamant to have a meeting with Foreign Affairs Minister Ms. Chrystia Freeland about it as soon as possible. Mr Legault, whose province houses many of the dairy farmers affected, said he would put the new trade pact and its impact on local farmers high on his to-do list. Furthermore, the CAQ said it would cut the number of immigrants allowed into the province each year to 40,000 from 50,000, and force newcomers to learn French or face the risk of being expelled. It is unclear whether Mr. Trudeau will oppose him on this point as such legislation would need federal approval. Market commentators meanwhile saw that Quebec now becomes the second major province in recent months to ditch the Liberal government of PM Trudeau after Mr. Doug Ford’s Progressive Conservatives had won the Ontario vote in June. Some fear that there is now a growing front of opposition to Prime Minister Justin Trudeau’s vision of the country at the regional level. In essence, the last five regional liberal governments to face an electorate have meant four losses for Mr. Trudeau.